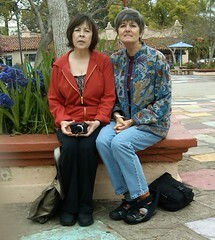 When Mistress of Longears was here, we visited Balboa Park. In the Mingei Museum, I sketched some patterns potentially for felt designs. Another lovely location in Balboa Park, the Japanese Friendship Garden. I am sooooooo excited!! 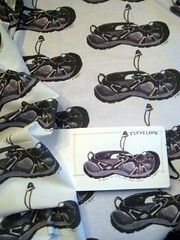 I've got a Spoonflower Jones big time! 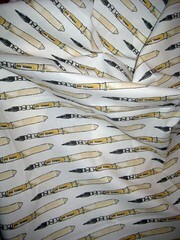 Yup, I downloaded images from my watercolor sketchbooks and they make it into fabric!! 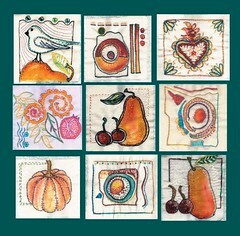 I immediately ordered 4 yards, each with a different design. Totally cool! 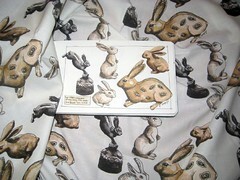 I'm very happy with Rabbit Collection and my mind is reeling with ideas. 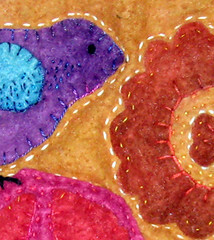 I could dye it, I could quilt it, I could make a shirt (well, have someone sew a shirt for me) I could make pillows or tote bags. Amy gave me a whole bunch of gorgeous parrot feathers from her flock. First, I had to draw them. 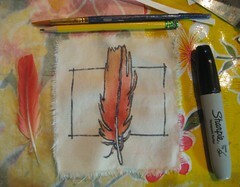 Then draw and stitch..oh oh. 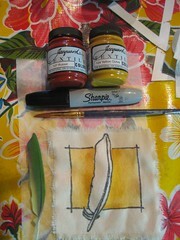 I can see stencils and feather prints in my future! 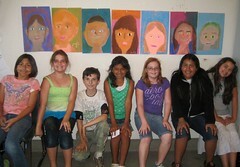 I did fish printing (gyotaku) with the Mundo Lindo kids last week, so here's what I made with my prints. 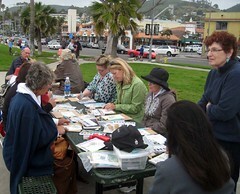 A beautiful day in San Diego, yesterday, for my one day workshop "Sketching & Watercolor: Journal Style." 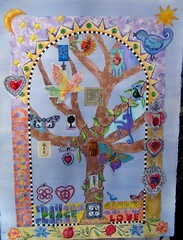 Eighteen participants. We accomplished a lot in one day! 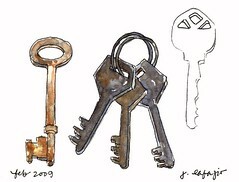 When you think about it, some learned to draw, to paint with watercolors, to paint in public for the first time AND draw a building! 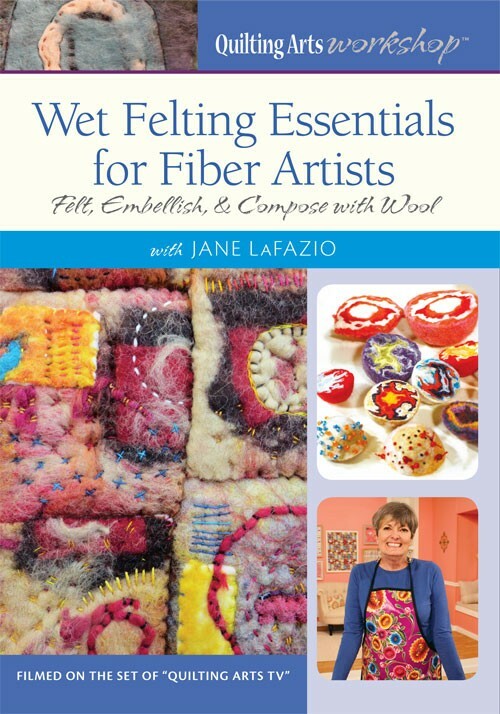 I'll be teaching this workshop again in November through the Shepherdess in Old Town San Diego. 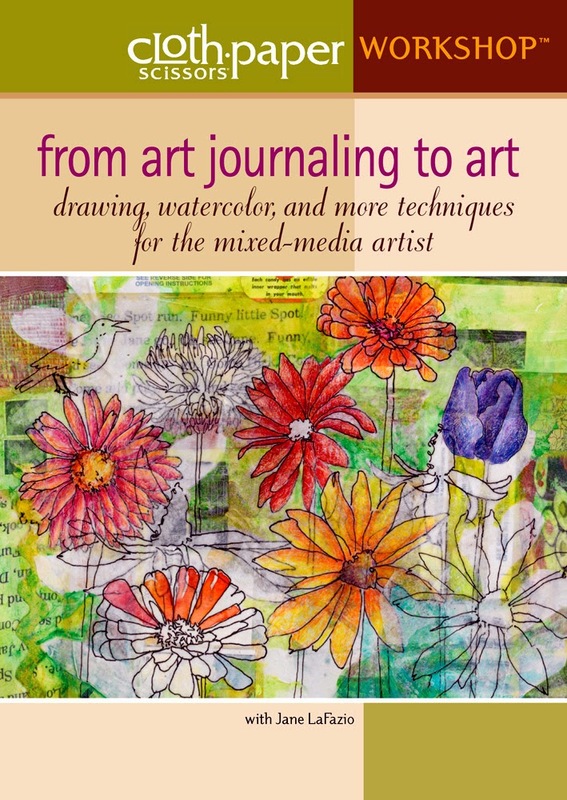 Registration is started for "Mixed Media with Paper & Cloth" online version. 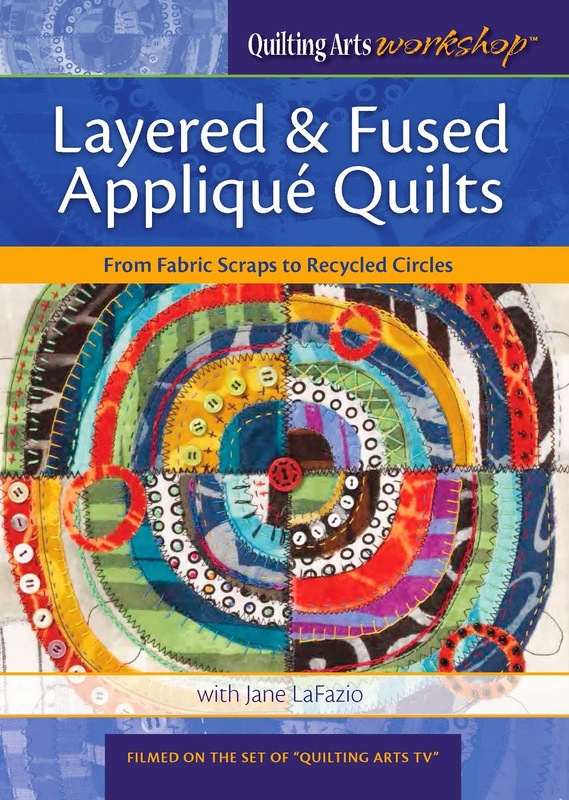 Remember my most recent article in Cloth Paper Scissors about "Recycled Circles?" It's one of the lessons in the online class. 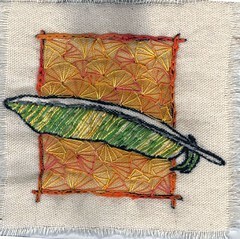 another quiltlet. 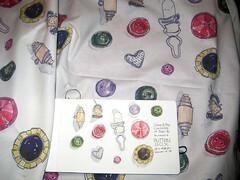 Or since it's a combination of a sketch and a quilt..a skilt? a quetch? 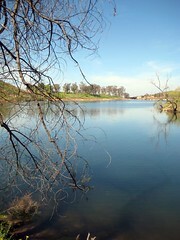 Husb and I walked around Lake Poway on Sunday morning. Only the second time we've done the trail since the fires of October 2007. 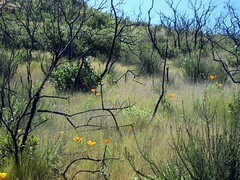 You can see the remains of the October 07 fire very clearly in the burned tree trunks. But also, the wonderful green and wildflowers. My photos of January 07 are here. 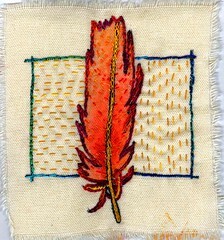 It's about 10 inches square, all Rit-dyed batting. 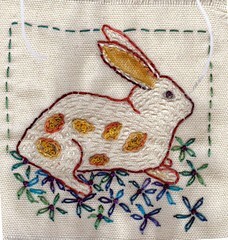 Hand stitched. Inspired by this one. 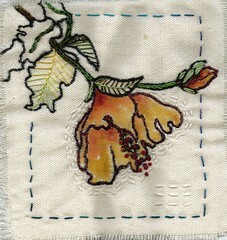 Rit dyed cotton batting project--sneak peek. 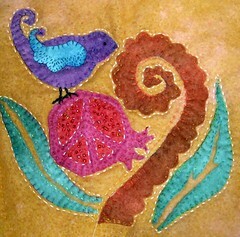 I still want to add a few beads to the pomegranate, then I'll show you the whole thing. 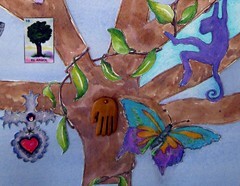 My watercolor page from yesterday at Laura's garden. It truly is a magical beautiful place! 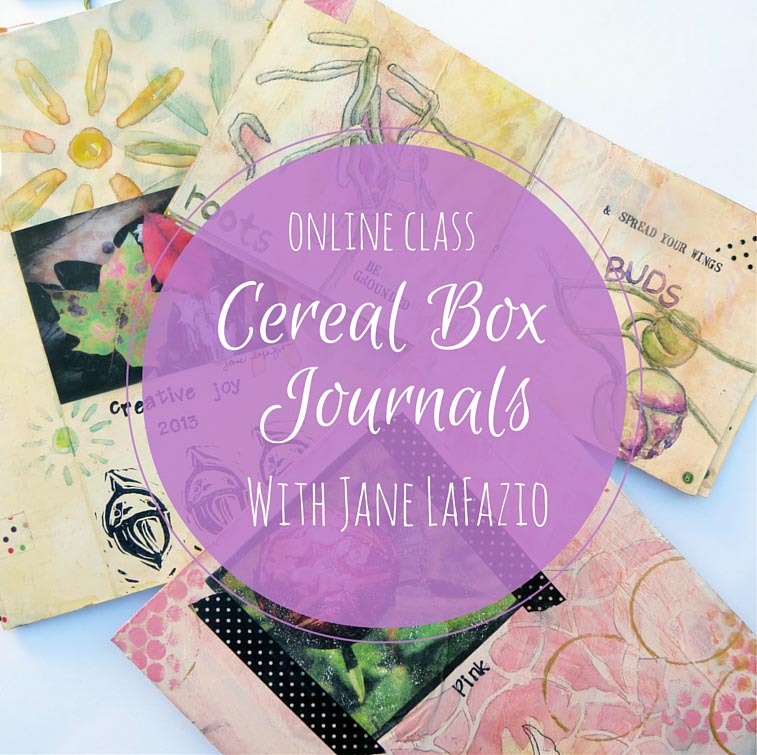 Be inspired to record your life, a special trip, or your daily adventures in a loose, quick journal style format. 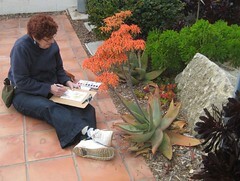 Spend the day discovering in my beautiful garden with artist Jane LaFazio. 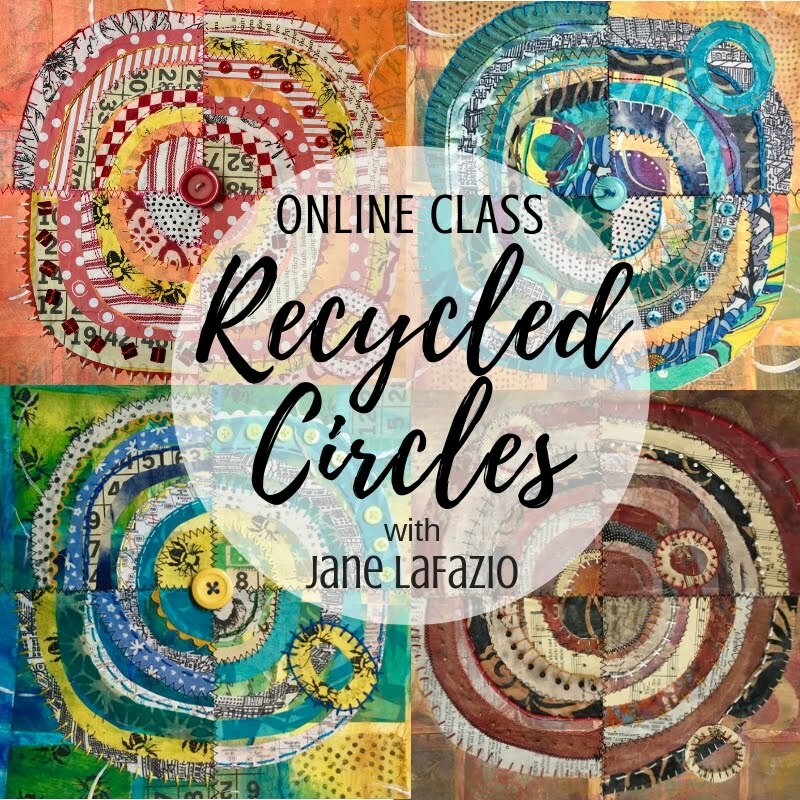 Jane, known for her friendly, encouraging teaching style, will demonstrate drawing and watercolors on location using a straight-forward, intuitive approach. 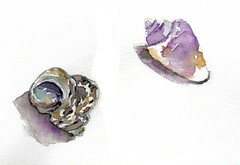 You’ll choose simple objects, vignettes or vistas to draw and paint, and then journaling your thoughts impressions on 5x7” pages. 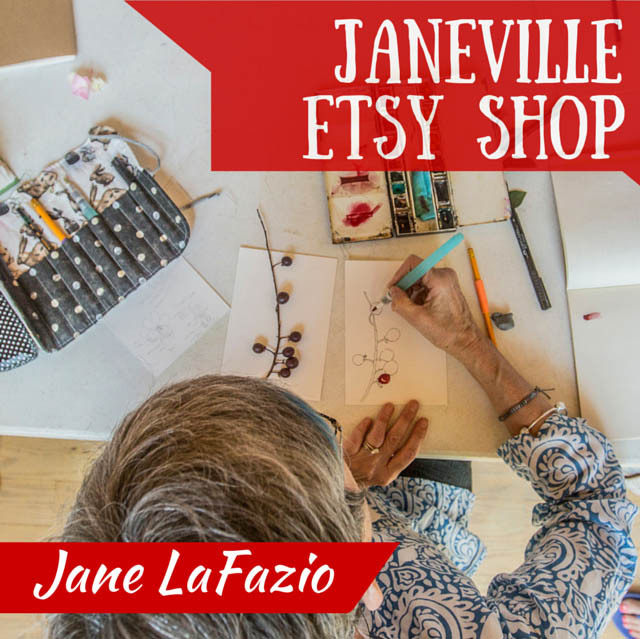 Everyone has their own drawing style, just like handwriting, and Jane will help you to see and then record what you see on paper. 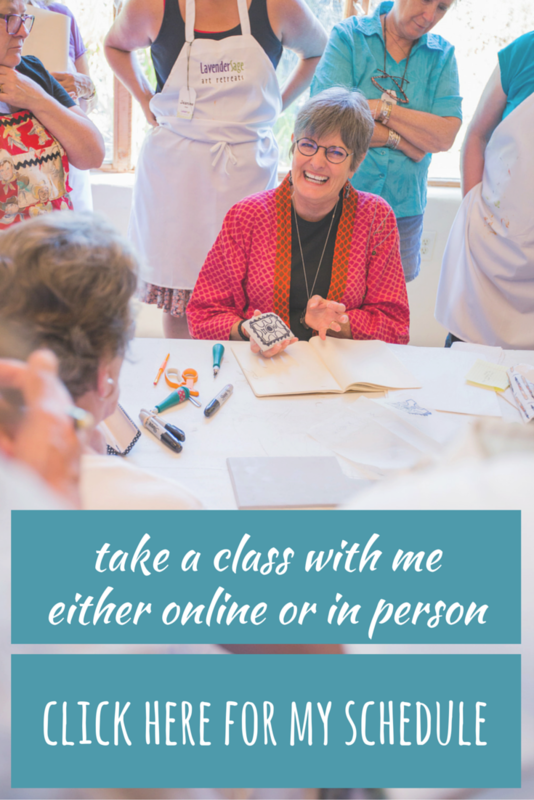 The class is geared for beginners, but all levels are welcome. 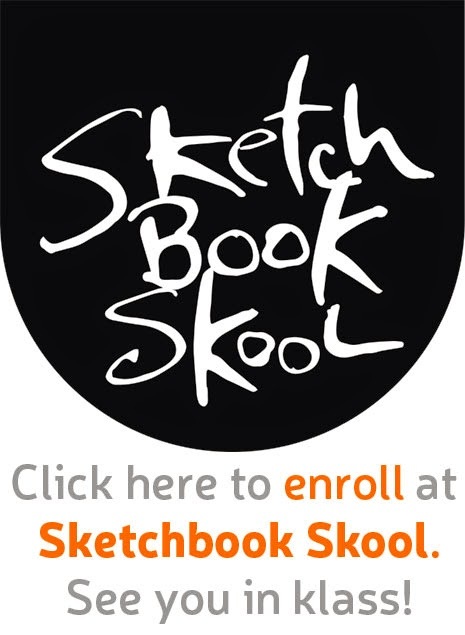 All materials are included in the fee. 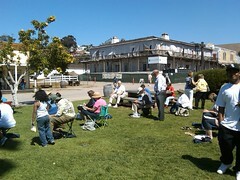 Bring a small camp stool or folding chair, hat, sunscreen and bag lunch. 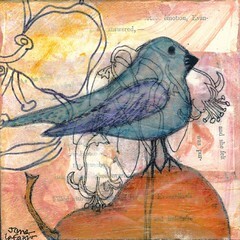 this is a 4x4" stretched canvas, and I must say, I think it's quite cute. 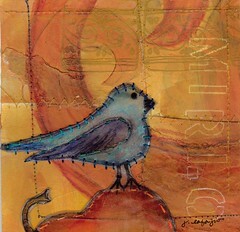 Recognize the bird on a pear from here? 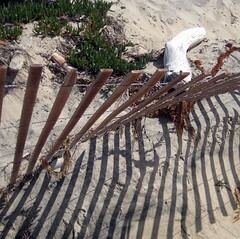 from our weekend in Laguna Beach. The colors are soooo beautiful. Remember the movie "Beaches" with Bette Midler? 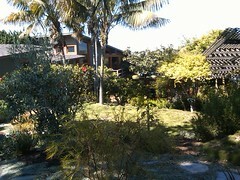 This house was 'her' house in the movie. 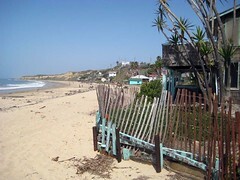 On the beach at Crystal Cove, just north of Laguna Beach. That would be the Pacific Ocean on the left. 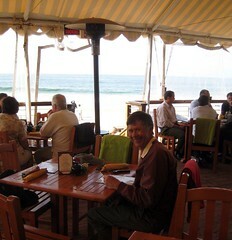 Husb and I had breakfast Monday morning at Crystal Cove. That's the Pacific Ocean in the background. 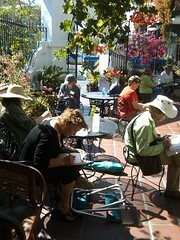 Elaine, one of my students, sketching in the garden in downtown Laguna Beach. 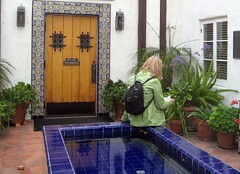 Laura, one of my students, in the garden in downtown Laguna Beach.